I wanted to implement the L.D.H.S. (Learning Develops High Self-esteem) Initiative to foster a positive and supportive classroom atmosphere. Every day, every class has a “student of the day”; that student’s name is randomly selected, and he/she gets his/her name on a miniature marquee, calls on classmates for selected readings, and shoots to make 3 out of 7 goals on our classroom basketball hoop while we clap on the makes as well as the misses—again, for positive support. We’ve been doing that along with having a student of the month, but this year I wanted to incorporate local businesses so that the students could see how much Laurens companies support their academic success, and for the Laurens companies to be aware of the hard work my students put forth in the classroom that could potentially translate to the hard work they could do as potential employees in our community. Students use their cell phones to enter the name of a classmate who gets their vote as student of the month, thus it is open to each and every student and completely decided by their peers. Social media can do more harm than good for some adolescents, but gaining the admiration and support of your peers by being voted as student of the month can boost your self-esteem and make others aspire to get that recognition more than a couple hundred likes from strangers on Facebook ever could. I’d like to thank Gerald Foggie and Foggie’s Barbershop, both Brian Harlan and Emily Dasher of the Laurens Family YMCA, and Marshall Davis III with Chick-fil-A of Laurens for their appreciated support of the L.D.H.S. Initiative as well as their gracious donations to the students of the month. I’d also like to mention that Marshall Davis III was so kind to provide a free breakfast item to every student in my first period class. In its second month, the L.D.H.S. (Learning Develops High Self-esteem) Initiative is continuing to create a positive atmosphere in the classroom while working with businesses in the community. 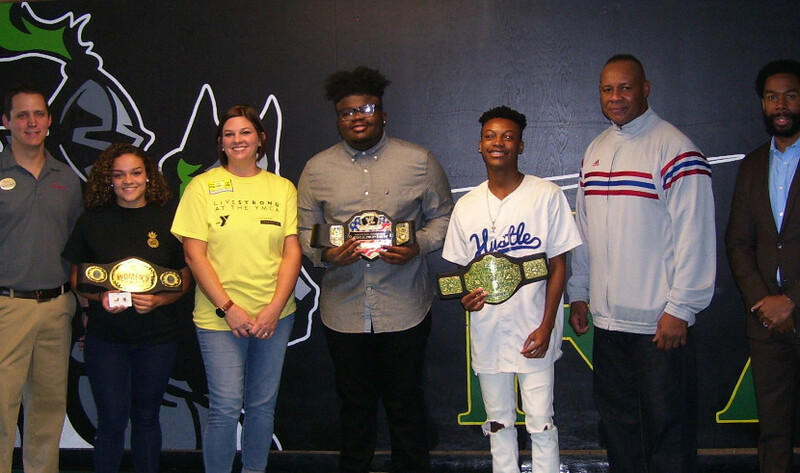 Students use their cell phones to enter the name of a classmate who gets their vote as student of the month, and companies have partnered with the program to reward the student winners. Past winners from August included Chris Harvey (2 free haircuts from Foggie’s Barbershop, courtesy of barber Gerald Foggie), Q Dunn (winner of a free month’s membership to the Laurens Family YMCA, courtesy of CEO Brain Harlan) and Lauryn Turner (winner of 3 free meal combos and 3 free desserts from Chick-fil-A, courtesy of Owner/Operator Marshall Davis III). I’d like to thank Ronnie and Debbie Campbell of Capital Theatre and Cafe, Brian Harlan and Emily Dasher of the Laurens Family YMCA, and Greg Brown and Rocky Elrod of the Halloween Express haunted trail for their appreciated support of the L.D.H.S. Initiative as well as their gracious donations to the students of the month. Greg Brown even offered to have Cameren Woody appear on Fox Carolina News during the morning show’s feature on the Halloween Express in Simpsonville, but Cameren had to decline due to a job obligation.